Nusajaya is expected to benefit from better Malaysia-Singapore bilateral ties. 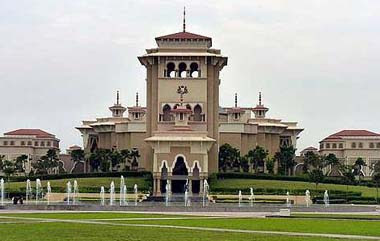 Picture shows Bangunan Sultan Ismail, the Johor State Legislative building in Kota Iskandar, Nusajaya. NUSAJAYA: A total of RM6.15bil in new investments from local and foreign investors have been received for development projects in the eight catalyst developments (except EduCity components) in Nusajaya. UEM Land Holdings Bhd managing director and chief executive officer Datuk Wan Abdullah Wan Ibrahim said the investments included RM500mil from Biocon Ltd, India to invest at SiLC (Southern Industrial and Logistics Clusters), RM2.3bil Canal Homes at Puteri Harbour by Bandaraya Development Bhd and RM500mil by Pantai Group for the Gleneagles Hospital at Medini. “Albeit operating in the global economic recession in 2008 and 2009, following the US sub-prime crisis and the European financial woes, we have been able to attract investments to Nusajaya,” he told StarBiz in an interview. UEM Land Holdings is the master developer of the 9,308ha Nusajaya, which is one of the five flagship development zones in Iskandar Malaysia. The latter is the country's first economic growth corridor, launched on Nov 4, 2006, and spanning 2,217 sq km located in the southernmost part of Johor. Wan Abdullah said Nusajaya was going to benefit from the improvement in bilateral ties between Malaysia and Singapore. “Prior to this improvement, Singaporeans were waiting for a signal from their government on whether to invest in Nusajaya or Iskandar Malaysia. “The announcement (in the middle of last year) that Khazanah Malaysia and Temasek Holdings would jointly develop a wellness township development in Danga Bay has sent a strong signal to Singaporeans to come and invest in Iskandar Malaysia,” he said. Apart from targeting Singapore investors, UEM Land is also looking for Singaporeans who want to buy property or a second home in Johor. “In Singapore you can't get get a landed property for S$1mil, whereas you can get a semi-D or bungalow in Iskandar for RM1mil,” he said. Another market UEM Land is seeking to tap is the middle-class segment from India, which comprises some 300 million Indians, and those from the Middle East. “Despite the political uprisings in the Middle East, the region remains high in liquidity due to the strong petro-dollar. They'll look at safe havens to park their money,” Wan Abdullah said. Five years ago, local and foreigners alike were quite skeptical when Nusajaya was launched amid a grand and glittering ceremony by the fifth Prime Minister Tun Abdullah Ahmad Badawi. Many doubted whether UEM Land would be able to undertake the gargantuan task once the party was over. “We have proven our skeptics wrong and many are now really impressed with the progress being made in Nusajaya since day one,'' said Wan Abdullah Wan Ibrahim . “Nusajaya was best described as a rough diamond in its early years. No one really gives a second look but with cuts on it, the stone is slowly showing its sparkle now,” said Wan Abdullah. Wan Abdullah said much work needed to be done before Nusajaya, which is the largest urban development in South-East Asia, under the became a regional city by 2025. Wan Abdullah said as the master developer of Nusajaya, the company's vision was to build a modern city with a focus on enhancing the lives of its residents. He said Nusajaya must be a city unlike any other city in Malaysia and that the city must have signature developments to realise its vision to become Asia's new regional city and benchmarking itself with other major cities in the world. Nusajaya comprises eight catalyst developments Kota Iskandar (Johor State New Administrative Centre), SiLC, Puteri Harbour Waterfront Development, EduCity, Health and Wellness, International Destination Resort and Nusajaya Residences. Wan Abdullah said apart from continuing to attract new investments and strong interest from investors, several of the company's completed projects in Nusajaya had also won prestigious awards such as the Fiabci Malaysia Property Award 2009 (Puteri Harbour), Best Golf Development CNBC Asia Pacific Property Awards 2009 (Horizon Hills) and Fiabci Malaysia Property Ward 2010 for Public Sector (Kota Iskandar). He said works on infrastructure and several projects in Nusajaya were on schedule and expected to be completed this year and within the next two to four years. These include the RM1.4bil Coastal Highway linking Johor Baru city centre to Nusajaya, Asia's first Legoland Theme Park, Indoor Theme Park @ Puteri Harbour, Marlborough College, Newcastle University Medical Faculty, Netherlands Maritime Institute of Technology and Pinewood Malaysia Iskandar Studios. “On completion of these projects, Nusajaya will have enough content to attract investors and residents,'' said Wan Abdullah. He added that it would be much easier to convince and attract them to Nusajaya as they could witness the developments taking place, unlike when it was first started five years ago. Nevertheless, Wan Abdullah said UEM Land would not rest on its laurels and feel satisfied with what it had achieved so far; instead it would work even harder to keep the momentum going. Kuala Lumpur and KLCC emerged as the leaders in Malaysia and Klang Valley respectively, in a survey of investment hotspots conducted among 421 participants by Swhengtee International. 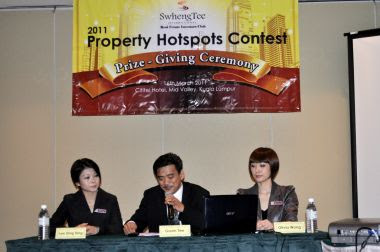 Matching a prediction by SwhengTee International Real Estate Investors Club founding president Gavin Tee, of them being the top hotspots, their connectivity from the Kuala Lumpur International Airport to the City Centre would result in the eventual internationalisation of properties there. Petaling Jaya came in second within Malaysia and the Klang Valley as a very attractive investment destination, because it is a matured city with lots of investment opportunities, which are present through usage conversion of its buildings, old factories, vacant land, and redevelopment value in its properties. Penang, Kota Kinabalu and Melaka took third, sixth and eighth places respectively, as they are international tourist destinations that are inscribed on UNESCO's World Heritage List. These places are tourism hotspots, making tourism-related real estate in these areas among investments with the most potential. Johor Bahru took fourth place, due to the impressive development taking place within Iskandar Malaysia, with foreign and local investments surpassing expectations in recent years. Other property hotspots in Malaysia include Putrajaya/Cyberjaya (5th), Shah Alam (7th), Seremban (9th), Ipoh (10th) and Kuching (11th). Within the Klang Valley, Kota Damansara came in at an impressive third rank, with a matured neighbourhood, excellent amenities, improved accessibility, and vibrant lifestyle. Its commercial and residential enclaves are set to benefit from the proposed Klang Valley Mass Rapid Transit Sungai Buloh – Kajang Line. Bukit Bintang (4th place ), as Malaysia's premier shopping district, stands to be a more vibrant tourism destination, when it is linked to KL Sentral, which is also connected to KLIA, through the Sungai Buloh – Kajang MRT line. With two stations proposed to be at Bukit Bintang East and Bukit Bintang West, it will become conveniently accessible to tourists. Other property hotspots in Klang Valley were Sungai Buloh (5th), Puchong/Kinrara (6th), Mont'Kiara/Sri Hartamas (7th), Jalan Klang Lama/Kuchai Lama (8th), Ampang (9th), Bangsar/Damansara Heights (10th) and Bukit Jalil (11th). It is reasonable to be worried about property bubbles forming as they may be scattered around various places within the next 3 years. The bubbles may look similar to the 1997 property crash, where properties were oversupplied and overpriced in unpopular areas. However, the general market will remain strong. Gavin believes the hotspots are changing more rapidly since 2008 as Malaysia steps into Real Estate Globalisation process after Singapore, Hong Kong and China. Greater KL, MRT and Mega Project developments have moved Kuala Lumpur into a world class city. 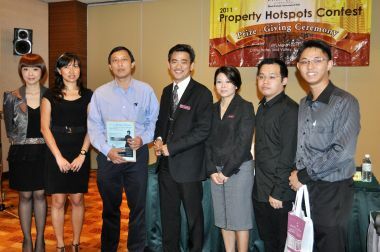 He predicts that service apartments or condominiums in Malaysia will hit RM5000psf within 5 years. Globalisation will turn CBD and tourist spots (Melaka, Penang, Kota Kinabalu, Langkawi, etc) real estate into properties with international price tags, thus, RM5000 psf (equal to SGD2000+) is nothing to be surprised about. He also explain that high price is partly caused by high land and building cost, the country's economic development, properties being commercialised and people are much more willing to put housing as priority in life. Gavin recommends to invest as the next 10 years are the 'Golden 10 years' in Malaysia real estate, However, he also reminds that identifying a hotspot requires a professional approach, study and high network. He concludes that hotspot may not be in the city centre. It can be a rural, river or new village development as long as the potential of growth exist. The hotspots will definitely distributed to all corners in the country. KUALA LUMPUR: ATLAN HOLDINGS BHD expects to gain RM16 million after the sale of two pieces of land along Jalan Batu Ferringhi, Penang for RM33 million cash to Glass Bay Sdn Bhd. It said on Monday, March 21 that the RM16.47 million was arrived at after deducting estimated income tax of RM5.49 million, land cost of RM9.19 million, development cost of RM1.84 million. On March 17, Atlan had signed a conditional sale and purchase agreement to dispose of two pieces of freehold land with a single storey sales office for RM33 million. In a reply to a query from Bursa Malaysia Securities, it said that it had decided to put off its original plan to build 40 units of ine-storey storey apartments with one-storey basement carpark. The decision to dispose of the land was after taking into consideration the estimated time frame and resources required to develop the land over the next three years given the competition of other developments within the vicinity and long gestation period to reap the full potential and benefits of the land. “The proposed disposal will enable the group to realise disposal proceeds of RM33 million and an estimated after-tax gain of disposal of approximately RM16 million thus unlocking the value of the land immediately upon the completion of the proposed disposal,” it said. Atlan said the proceeds from the proposed disposal would be used to repay bank borrowings, interest payments and to finance the group’s funding needs.